In central Edinburgh, the highest point is the spire of the once named Victoria Hall. Though never consecrated as a Church, Victoria Hall was built to house the General Assembly of the Church of Scotland. No longer in use for ecclesiastical purposes, the building was renovated in 1999 to become offices and a performance space for the Edinburgh International Festival. Now known as The Hub, the location is one of the premier event venues in Scotland's capital city. In the summer of 2018, Amanda Weir, C’19, a communication major, had the opportunity to intern with The Hub's sales team. Some of her responsibilities included updating the company’s web listings, writing blog posts and researching award criteria. She also revamped the company’s Pinterest page to showcase The Hub’s event spaces. Weir’s experience at the Mount, especially in the study abroad program, gave her the confidence to pursue such a challenging and rewarding internship. 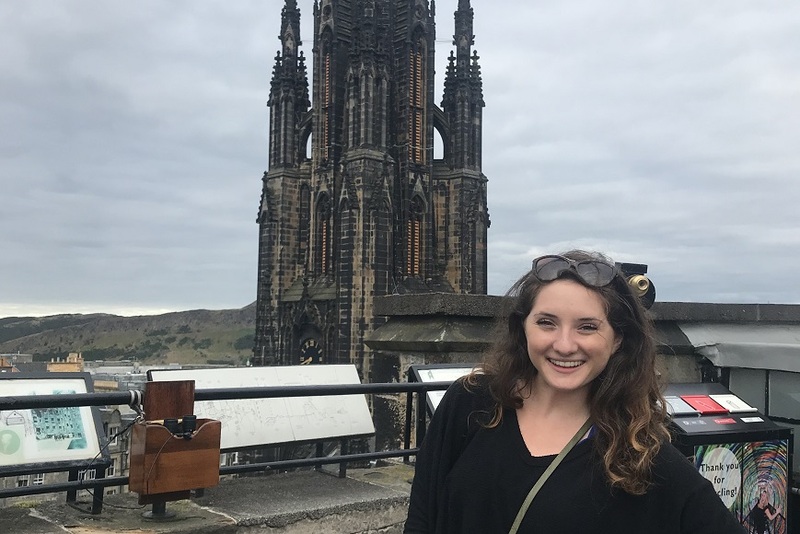 “It was The Mount’s study abroad opportunity in Dublin, Ireland, during the fall of 2017 that made me realize that there are truly no limitations to what you can achieve as long as you go after something wholeheartedly,” said Weir, who confidently applied for the international internship at The Hub. If the study abroad program provided the experience to build Weir’s confidence, her communication major equipped her with the skills to meet the professional challenges. Weir commented, “The knowledge to effectively communicate through both written and oral mediums were especially useful during my time abroad. I can’t wait to see how I can apply it to my professional life!” Upon graduation, Weir will explore careers in copywriting and communication marketing, and she will continue to journal her domestic and international adventures on her travel blog: amandaweirtravel.weebly.com. “The Mount has consistently pushed me to expand my boundaries, whether through faith or academia,” Weir reflected. Her experience at the Mount helped her to see how life is meant to be integrated. She wrote for The Mountain Echo, was a member of the Mount Choir and had her poetry published in the 2016 edition of Lighted Corners. Additionally, she worked as a peer tutor for public speaking. “As a communication major, I am intrigued by the harmonious relationship between writing, creativity, and public speaking, which together can be applied to so many different fields,” Weir said. Through her commitment and hard work, and with the skills she acquired through the Mount’s liberal arts program, Weir is prepared for further success.